The last American president to say something like that and mean it was Ronald Reagan, who also defeated Putin’s old bosses. The current administration, which frees Taliban leaders and makes concessions to Iran for the sake of what it calls “Smart Power,” couldn’t defeat a wet paper bag. Fresh from his serial humiliations of Obama on the NSA and Syria, Putin has risen to the top of Forbes’ Most Powerful People list. At No. 2 is Obama, right ahead of his banker and loan shark, Xi Jinping, the General Secretary of the Chinese Communist Party. Putin has trashed Obama’s national security and foreign policy with little leverage except a UN Security Council seat and bit players like Julian Assange, Glenn Greenwald and Edward Snowden, who are a long way down from the powerful insiders like Alger Hiss and Kim Philby that his old bosses used to rely on. Whether it was Russia’s troubled energy industry or a global espionage network starved of influence after the collapse of Soviet Communism; Putin made the most out of what he had to work with. And that is in sharp contrast to No. 2 who made the least out of the incredible power base at his disposal. Obama’s foreign policy goals weren’t only bad ideas, but he hasn’t even been able to accomplish them. The Arab Spring, which was supposed to be his signature foreign policy achievement, has imploded spectacularly, leaving him to issue impotent political threats to the Egyptian government and impotent military threats to the Syrian government. Like every previous flailing administration looking for a cheap win, Obama has taken to browbeating Israel into signing some sort of peace agreement with the terrorists. An administration’s pivot to the “Peace Process” is usually an admission of failure on every single other foreign policy front. Obama may have lost Egypt and Syria, but he’ll always have Israel to kick around the negotiating table. While Putin is carving out his Eurasian Union, Obama’s Asia pivot has come to nothing, his Arab Spring is gone and he has nothing to show for his constant international trips except a bunch of “I’m with Stupid” souvenir t-shirts in forty different languages from forty different foreign leaders. America has never been this impotent and irrelevant. Not even under President Carter was it such a nonentity on the international stage that it could be ignored and dismissed. Unlike Putin, most of the rest of the world isn’t even bothering to humiliate Obama. Even friendly world leaders think of Obama as a party guest, a lightweight who makes for some good photo ops but has nothing of substance to contribute. If you want to throw a banquet you invite him over, but if there are serious decisions to be made, you invite the grown-ups instead. Obama’s big accomplishment was presiding over the end of the American Century. 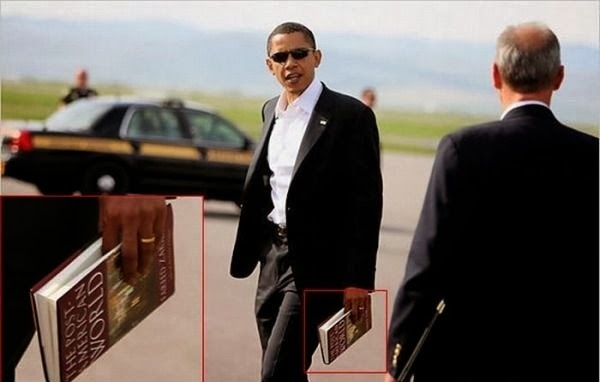 The famous photo of him carrying around a copy of The Post-American World has become a self-fulfilling prophecy. He has made the world into a Post-American place where the United States is as relevant as the British Empire. Obama’s vision of smart power sought to trade state power for ideological power. Instead of countries paying attention to him because of the power of the country he represented, they were supposed to pay attention to him because he represented a global evolution toward progressive values. It’s hard to think of a more laughably stupid misreading of human history and motives through ideological blinders. The ideological power that Obama wields domestically comes from a domestic liberal establishment that is sympathetic to his aims. Without that establishment, he has no power outside American borders. Even in the West, the establishment which gave him an unearned Nobel Peace Prize was not giving him the blank check that his domestic backers did. American liberals linked their political fortunes to Obama, but European leftists never did. America is too useful an enemy for their political purposes. Obama chose to be a man without a country. He didn’t want to use American power and has been left powerless instead. And America has been left leaderless and therefore powerless. The United States is now desired mainly for its arsenal. The Saudis and other Gulf Arabs impatiently order Obama to bomb things and insult him when he delays. And even the arsenal has been degraded. American military capabilities have been badly impacted and the military is under the jurisdiction of men like Chuck Hagel who prioritize gay marriage and Green Energy over military preparedness. No other country has stepped in to fill the power vacuum left by the end of the American Century. Russia is satisfied to cause harm, but can no longer wield any real power over the rest of the world. China has wealth and power, but is far too insular to offer anything beyond its borders except trade agreements. In time it may be forced to step into our vacuum and protect its lifeblood of international trade with a Pax Sinica, the way that the United States formerly did with its Pax Americana. Muslim conflict has increased exponentially with an emboldened Al Qaeda and its franchises spreading terror and death in their home countries, but these groups can barely get along with each other. Their dream of a caliphate dies at their own hands. Japan is trying to find its own strength again, but it may be too set in its ways to change. And Europe continues its fossilization into the stratified irrelevance of the European Union that may represent our own future of bureaucratic malaise and cultural decadence. For good or ill, there is no one to step into the big boots of Uncle Sam. Obama’s abandonment of American power has left behind a massive hole. The waves of instability from that black hole are destabilizing governments and societies. For generations, America has been the center of the world. Without it, the world is spinning out of control. A glance at the evening news may not leave the impression of a world at peace, but that is only because we have forgotten what true war is like. Before the Pax Americana, devastating wars far greater in scale than anything most of us have lived through were ubiquitous. Liberals like Obama believed that international conflicts were caused by American power. And so they set out to destroy that power. Their success means that the real wars that the Pax Americana repressed will begin again. The end of American power means the end of world peace.